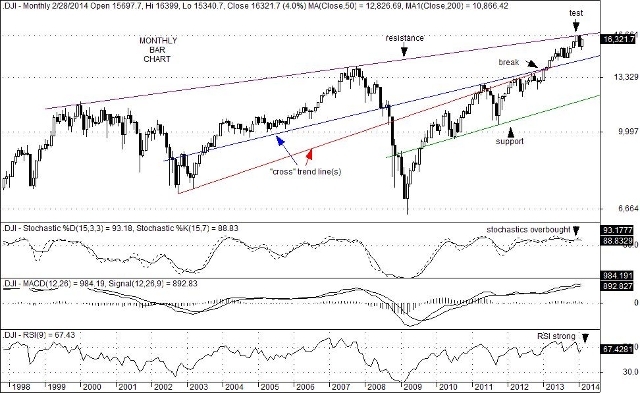 With overbought condition stubbornly present on monthly bar charts, the Dow Jones Industrial Average appears to be aimed for a retest of long-term uptrend resistance that currently sits at 16,660. The real question is: Can a breakout in the DJIA occur anytime soon? The last time this trend line resistance was challenged was on the final day of trading last year (2013) then at the 16,588 level. While it is impressive that equity prices have largely recovered their losses suffered during January, a breakout to the upside might nevertheless be difficult to do at this time. Widespread expectations of a steeper yield curve (resulting from the taper and a nascent rise in commercial loan activity) however, could mute the thought of a continuation to the multiple expansion that began last year. Moreover, tempered earnings guidance from a number of CEOs this quarter have also dimmed growth expectations for at least the first half of 2014. Adding to this downbeat outlook is, of course, weather related problems that have resulted from unusual winter extremes. Rapidly rising tensions in Ukraine combined with slowly rising tensions in the South China Sea could also take on more prominence if saber rattling events were to escalate. Such a prospect could tilt investor confidence to the downside and diminish trading activity. As a result, equity prices could suffer with bond yields moving lower in a run-to-safety maneuver. Gold and energy prices could move markedly higher, particularly if natural gas supplies were to be interrupted to Ukraine or to European destinations as a byproduct of Russian political tactics. In any event, a test of the 16,600 level on the DJIA might present an opportunity to hedge the likelihood of event-risk issues at this time. This entry was posted on Monday, March 3rd, 2014 at 11:26 am	and is filed under Dow Jones Industrial Average (DJI). You can follow any responses to this entry through the RSS 2.0 feed. You can leave a response, or trackback from your own site.